Brad joined the Annapolis Hinckley and Hunt sales office in 2017. He brings a wide variety of technical and practical skills to the Hinckley team, in addition to a strong background in customer service and support. He first began working with Hinckley in 2016, delivering boats and addressing complex technical problems at the Oxford, MD service yard. 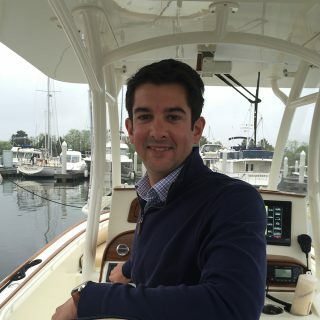 Brad holds a degree in Naval Architecture and Marine Engineering from the University of New Orleans, and most recently worked at the venerable Band Lavis Division of CDI Marine, specializing in the design and construction of high-speed small craft and managing client relations. An accomplished powerboat rigger, he is the Crew Chief for The Talbot Excavating Offshore Racing Team, leading the team to World Championships in 2013 and 2015. Brad holds a 50-ton Captain’s License and is an ABYC Master Technician. When he is not boating or fishing on the Chesapeake Bay, Brad can be found at his family’s cottage near Clayton, NY in the 1000 Islands.